The fee is a constant reminder and continues to reinforce the importance of reusable bags. Taking the fee away could very likely cause a backslide and plastic bag use could increase, especially since the fee has only been in place for a few years. The longer the fee is in place the more local shoppers develop the habit of bringing reusable grocery bags to the store. Things might be different had the fee been in place for 10, 15, or maybe even 20 years – the reusable bag habit would be more firmly entrenched, there would even be some shoppers who only knew life with reusable bags. Doing away with the fee at that point may not be so detrimental. Three years is a significant amount of time, but there would definitely be some shoppers who would switch back to plastic bags. Removing the fee may also remove the incentive to use reusable bags. Shoppers who simply forgot their bags in their car may go ahead and bag their groceries in plastic instead of making the trip to retrieve their reusable bags. The fee still serves a vital purpose and can only contribute to the continued success of limiting the use of disposable plastic bags. A secondary and unexpected benefit of the fee is how the monies raised will be spent. Under the current bylaw retailers take in about $5.4 million a year which they keep. Councilor Michelle Berardinetti is drumming up support for a plan that would ask retailers to direct some of the money to planting trees throughout the city. With the invasion of the emerald ash borer many trees have been lost in the area and the city’s tree canopy is down to about 19% (35% coverage is considered ideal). Fixing this problem will cost about $10 million dollars. The City of Toronto does not have $10 million to spend planting trees. Berardinetti is proposing that monies from the plastic bag fee can help cover part of the expense. Retailers that donate their fee money will be allowed to claim the charitable donation and display a notice alerting their customers that they supported efforts to plant trees in their City. “At the end of the day, the taxpayers are going to have to pay for that tree canopy one way or another. If they want to rescind the fee, the issue is we’re going to have to increase the property tax,” said Berardinetti. 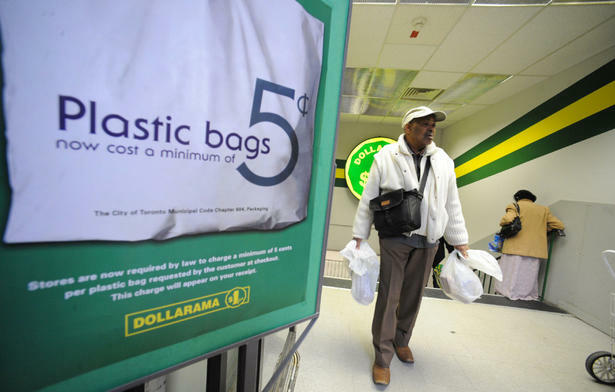 The plastic bag fee is a powerful tool that helps guide shoppers towards Eco-friendly reusable grocery bags. The fact that the fee money could be used to benefit the environment beyond limiting the amount of plastic bags unleashed on the City is an inventive and ingenious solution. Increasing the tree canopy is a necessary goal that will benefit the City. The money to plant the trees has to come from someplace and what is so great about possibly using the plastic bag fee money is that it allows a positive use to come from money raised by using plastic bags. Plastic bags take an adverse toll on the environment and the people who continue to use plastic bags are the ones who pay the fee and would potentially help cover this expense. There is a lot of support to keep the fee is place so hopefully it will remain a law and continue to encourage the people of Toronto to think about both plastic and reusable bags. Even if the money is not used to plant trees and the fee money stays with the retailers this law is still a constructive and positive influence and a reminder to bring your reusable bags when you go to the store.